An exclusive first look at the drinks inside On The Record’s Vinyl Parlor in Las Vegas. On The Record, the new Las Vegas nightclub and speakeasy from scene-making L.A. twin brothers Mark and Jonnie Houston, is a music-inspired spot that wants to evoke the pre-iPod era. The 11,000-square-foot space begins with a two-story record store. On the Record also has karaoke rooms inspired by the 1970s, ’80s, and ’90s. As the Houstons walk me through the club, they reveal that they’re using the front end of a chopped-up Rolls-Royce as a DJ booth. Outside on the patio is another DJ booth inside a British double-decker bus. On The Record, with its vintage posters, album art, and sensor-activated light-up floors, is art-directed like a transporting movie set. The Houstons like to think about how working on this space feels like discovering a hidden catacomb in the Park MGM resort. And if you find something that’s such a blank slate, why not build a time machine? So, yes, On the Record will have its grand opening on December 28 with the official after-party for Lady Gaga’s Park Theater residency debut, but it’s also a place where you might hear songs by Fleetwood Mac, David Bowie, or Talking Heads. There’s even a room where you can pick an album and have a truly one-of-kind cocktail experience built around what’s playing in your headphones. On the Record’s Vinyl Parlor is a 25-capacity lounge where guests get record players and bluetooth headphones. Select an album or a specific song and you can enjoy a drink inspired by it. So if you pick, say, “Pretty in Pink,” you might get a cocktail with cotton candy or perhaps a pink liqueur. Different guests could pick the same song and get different drinks. You could select a song twice in one night and end up with two different cocktails if that’s what you’d like. Bartenders will make cocktails based on the vibe of the customer and the dynamics of the moment: what time it is, whether it’s the beginning of your night or you’re having a nightcap, whether you’re on a date or with a big group. And, anyway, Schoettler adds, think about how a multi-layered song like Queen’s “Bohemian Rhapsody” changes moods and speeds, and how this can make you feel distinctly different ways. Or consider how Jimmy Page’s guitar solos can change from concert to concert. The Vinyl Parlor is a place for riffing. Beyond these customized drinks, the Vinyl Parlor will also have a menu with a dozen-or-so music-inspired cocktails from some of the country’s most respected bartenders. All of these bartenders-in-residency will take turns making drinks at the Vinyl Parlor in the next year. Jillian Vose of New York’s Dead Rabbit, for example, will be at On the Record on January 18 to 19. Her contribution to the Vinyl Parlor menu is the Psycho Killer cocktail with Redbreast 12-year-old Irish whiskey, absinthe, campari, Giffard white crème de cacao, and Giffard Banane du Brésil in a Nick & Nora glass. 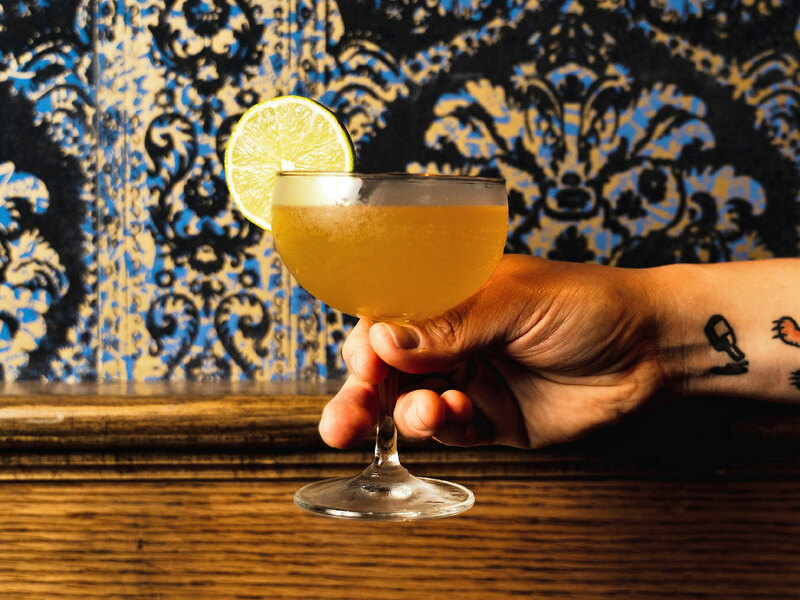 Erick Castro of San Diego’s Polite Provisions will have his Road to Nowhere with Commerce gin, lemon juice, pineapple juice, yellow chartreuse, honey syrup, orange bitters, and absinthe at the Vinyl Parlor. NoMad’s Leo Robitschek will have the Detox-Retox with blended Scotch, Venezuelan rum, pineapple rum, aged cachaça, coconut water, and angostura bitters. “You come to Las Vegas and you get the greatest hits of the United States, bartending’s greatest hits,” Schoettler says. The Vinyl Parlor’s bartenders-in-residency lineup also include New York bar stars like Alex Day and David Kaplan of Death & Co., Jim Meehan of PDT, Pamela Wiznitzer of Henry at the Life Hotel, and Ivy Mix of Brooklyn's Leyenda. California is being represented by mixologists including Kevin Diedrich of San Francisco’s P.C.H., Ryan Fitzgerald of San Francisco’s ABV, Josh Harris of San Francisco’s the Bon Vivants, and Aaron Polsky of L.A.’s Harvard & Stone. Las Vegas’ own Tony Abou-Ganim and Daniel Marohnic will also take a turn behind the bar, as will Simon Ford of Fords Gin. The Vinyl Parlor’s menu will be a mix of hit drinks and original creations. The plan is to have seasonal cocktail menus. Other bartenders will be announced in the future. The Houstons grew up in L.A. and fondly remember visiting Tower Records and other record stores to look at album art, buy music, wait in line for concert tickets, and leave with something “tangible.” It’s the kind of shared experience that’s dying, of course, which is something that the brothers think is unfortunate. But one reason that On the Record exists is to remind you that all kinds of music still bring people together. Karaoke, for example, can turn complete strangers into instant friends. And it only helps that the T-Mobile Arena’s concerts are steps from Park MGM. On the Record will have impromptu live performances. Expect surprise guests, cabaret acts, and some jazz. The Houston brothers plan to offer food on the patio. The idea is to bring in some high-profile chefs that they’ve encountered at music festivals like Coachella. Stay tuned.